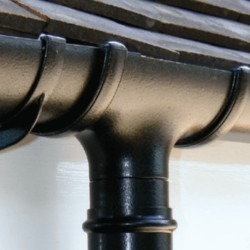 Cast Iron Effect Half Round gutter has been manufactured to closely resemble the original Victorian Gutter system, both in profile and the finished effect. If you have never seen Cast Iron Effect guttering before the overall appearance of a finished installation is both impressive and deceiving - it really does like metal gutter, both on high level and low level installations. The mottled, satin effect is achieved in a secondary paint process using a closely guarded formula. The results are dramatic and speak for themselves. What's more this unique finish is guaranteed for 20 years. 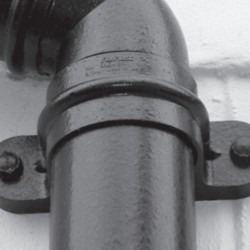 Unlike normal Half Round guttering, the downpipe fittings for the cast effect system are also manufactured to resemble their cast iron predecessors, with clips, bends, connectors, shoes and hoppers all incorporating classy feature mouldings that add to the period feel of the system.